My daughters and I had a great time making these pillowcase last year. I am sure we will be able to make a few more. 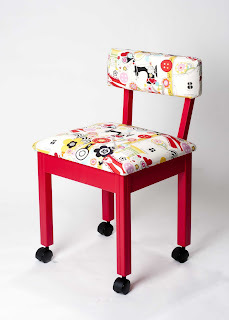 OH my goodness that is the chair that I want so badly to go with my arrow sewing cabinet and my suzi side kick cabinet ... I am going to see if I can swing making a few pillow cases ... thanks so much! I am in the UK, can I enter???!! How fun! I just made a few pillowcases last week. I need to make a Valentine's themed one and get them sent off. Thanks! I just taught my 10 and 15 Year old Granddaughters to sew. I am also finishing up teaching an adult class to sew. I'll send this to the adults and also show my Granddaughters how to make pillow cases that we can send. BTW - love the chair! I would love that chair, so I better get sewing! I'm making pillow cases already! Not for the chair though....I won a Gidget II on Jan 2 and I still have not heard from you. I am wondering if the email got lost or what??? Just worried that I missed it is all. Will we see some of the pillow cases posted? I love making them. What a great idea to cheer people who aren't feeling well. I can't wait to make two. We LOVE making pillowcases especially for such a wonderful cause. My daughter is in the process of making 20 pillowcases as part of her service hours for National Junior Honor Society. So making a few more will just be that much nicer. Doing something for someone else is the best lesson i can ever teach her. Wonderful blοg! I found it while ѕeaгching on Үahoo Nеws.